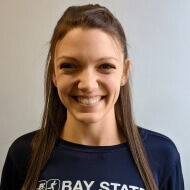 Sara earned her Doctorate degree in Physical Therapy from Northeastern University in 2018 after receiving her B.S. in Exercise Science from the University of North Carolina Wilmington. Her passion for physical therapy began when she attended PT for various injuries as a young volleyball and softball player. Sara’s clinical interests include orthopedics and sports injuries, manual therapy, working with kids and teens, and helping patients of all ages get back to the activities they love. In her free time, Sara enjoys reading and any activities that get her outside, including volleyball, running, biking, hiking, and going to the beach. She also loves to travel- Sara has spent time living in both Costa Rica and Hawaii and has ridden her bike across the entire US. She looks forward to helping others stay involved with their own hobbies and passions.